First posted May 25th, 2010 on Liquorature. Surprisingly mellow sipper from a purveyor not noted for such drinks; not overly complex, but warm, buxom, heavy and with a rich nose and body. This is the Mother Hubbard of rums, to keep in the cupboard. Right from the get go I must mention that I’ve given Captain Morgan a wide berth thus far, simply because it always had a reputation as a low- to mid-level mixer. The fact that it was a spiced rum – whether or not it says it is – also added somewhat to its plebian cachet. Not that I have a real issue with that, but there’s so much other good stuff out there that I don’t need to go to Puerto Rico for my rums. Without trying to be insulting, the fact is that Puerto Rico, which enjoys a favourable import tax regime with the US, makes the Budweiser and Coors of rums, with all the negative connotations this implies. In making common hooch to appeal to the widest possible audience and lowest common denominator (the US consumer), some of the quality is lost in the quest for sales. 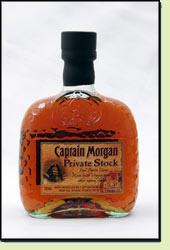 The Captain Morgan brand actually originated in Jamaica, where Seagrams bought the Long Pond distillery in the 1940s. Tax incentives favouring Puerto Rico caused them to transfer manufacturing to a factory outside San Juan (close to where the Bacardi family was setting up a factory at the same time); in 1985 they sold the rights and brand to Diageo, a British concern and the largest spirits company in the world. Diageo noted that they will transfer the production facilities to St Croix in 2011 or thereabouts. Nowadays there is a Captain Morgan Rum produced in Puerto Rico by Seagram (or its successors), and another by J. Wray and Son in Jamaica. Having bored you to tears with all of this tedious history and trivia, the question remains, is it any good? Going in, I wasn’t sure: my experience with Puerto Rico was previously with Bacardi – the bestselling rum in the world and the choice of expatriates in far flung and remote corners of the world such as where I used to be – and Bacardi is a well-meaning, reasonably tasty but generally boring mixer — I tarred Captain Morgan with the same broad brush. Surprisingly enough, however, it really is quite a good rum. In fact, it’s a really nice sipper for the newbie who wants to get away from mixers without losing the body and taste. But I should add this was largely because of the inclusions and additions (primarily sugar and vaillas), not because of brilliant ageing and blending skills. The nose is candied and overwhelms right out of the gate with vanilla and caramel. The dark undertones of molasses are clearly in evidence. The dark body has some strong legs, yet they don’t kick you in face with harsh spirit notes either. This is why as an intro to a sipper, Catain Morgan is a pretty good way to start. The sweetness usually imparted by coke or other mixers that cut the spirit burn is essentially taken over by the spices added to the rum itself. And clearly effort has been taken to mute and smoothen out the palate. The downside of this is that beyond the candy of these spices, it takes a real expert to taste anything else: try as I might, I could not discern more than butterscotch, vanilla and caramel and some very faint traces of what may have been orange. The finish is also surprisingly smooth and even, and lasts quite a bit. This may be attributable to the spices, but even so, for a three-year-old rum, I’m quite impressed. As an SDR, it ranks right up there, though its lack of complexity and deeper rum notes render it unsuitable for more discerning (and choosier) palates. Speaking for myself, I’d buy this again, sure. It may not be top tier (I paid just under $30 for it), but I have a sweet tooth and enjoy a decently crafted rum that is at home either by itself or in company with a cola. As a man who has spent triple digits searching for the best of the best (and been disappointed more than once with expensive losers that fail on the finish), I cannot fault the Captain Morgan for not aspiring to great pretentiousness. So, unlike a Coruba, which I’d feed to favoured enemies in quantity, this one I’d gladly share on a warm sunset or cold winter night with my friends – for a low end rum, from me, that’s high praise indeed.